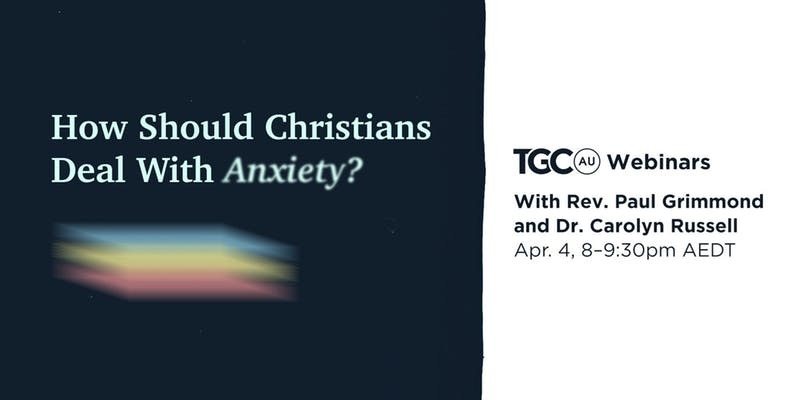 TGC Webinar – How Should Christians Deal with Anxiety? How Should Christians Deal with Anxiety? The Gospel Coalition (a network of Bible-believing churches) is running a Webinar on Thursday 4th April from 7pm to 8:30pm (QLD time) on the important topic of “How Should Christians Deal with Anxiety?”. You can watch from home and send in your questions. There’s 2 excellent speakers on this topic, Paul Grimmond an Evangelist/Pastor from Sydney who has struggled with anxiety all his life, and Dr Carolyn Russell, a Brisbane-based GP Counsellor who teaches pastoral care at Queensland Theological College. Tickets need to be pre-purchased for $12 using the link here.